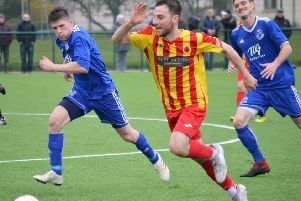 Rossvale demolished derby rivals Ashfield with a 5-1 win in their West of Scotland Cup first round clash at the Peugeot Ashfield Stadium. Gordon Moffat’s side were in charge from the off and the first goal came before most of the support had taken their seats. The ball reached Liam McGonigle just inside the box and when his effort came off a defender it landed for captain Jamie Hunter to fire a terrific shot into the far corner with the keeper well beaten. Matt Niven’s header brought out a good save from home keeper McLenaghan, before Ashfield came close when Parker whipped in an excellent cross to Hearton whose effort went past. Rossvale should have doubled their tally on 15 minutes. A long ball from keeper Gordon found McGonigle inside the Ashfield box but his shot went narrowly past. McGonigle and Chris Zok then tore the defence apart with some slick passing, but again McGonigle’s final shot was just wide. A hard task for Ashfield was made even more difficult for them on 25 minutes when Cochrane was sent off for dissent. But three minutes later they were level. The Vale defence switched off as the ball was headed to the back post where McManus turned the ball into the bottom corner of the net with a neat header. After this it was nearly all Rossvale attack but the sides remained level until 12 minutes into the second half when the visitors struck twice in a minute. First Gary Giffin buried a first-time effort after Zok and McGonigle both had shots blocked. Then, straight from kick-off, Giffin got away to cross for Zok to blast past the helpless McLenaghan. Vale could have scored again two minutes after that when they were awarded a penalty for a heavy tackle on McGonigle by Passmore, but McGonigle was denied by a tremendous save by McLenaghan. Further chances came and went before Rossvale finally added another six minutes from time as Craig Buchanan’s throw-in found McGonigle who beat his defender and slipped the ball past the advancing keeper. And with a minute to go Josh O’Hare found McGonigle at edge of the box and he finished an excellent day with another well taken goal.